Long before the expression 'dealmaker' became commonplace in India, Naina Lal Kidwai, 54, currently country head of HSBC, was one of the biggest dealmakers in the country. It goes without saying that she was also one of the first women to enter the formerly male bastion of investment banking and rise spectacularly. "When I embarked on this journey, I didn't think women would be where we are today. It is very gratifying," she says. Her first job, decades ago, was with Price Waterhouse, now PricewaterhouseCoopers. An economics graduate and a chartered accountant, she was bluntly told during the job interview that the firm did not employ women. Yet it hired her. 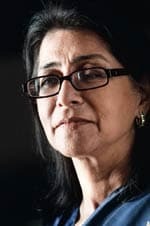 The list of Kidwai's firsts is staggering: she was the first Indian woman to graduate from Harvard Business School, or HBS; the first woman to be hired by PriceWaterhouse in India; the first woman to lead a foreign bank in India. 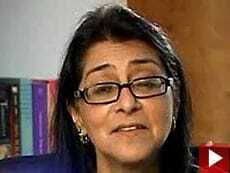 Kidwai says she had to work "very hard" to find her space among the men. "I am very inspired by her," says Smita Nair, director of investment banking at HSBC Securities and Capital Markets (India), who has worked with her for six years. "I want to be like her." Kidwai reveals she was the first woman in her family to work. "I come from a very conventional north Indian family," she says "But my parents had aspirations for their children, and because I didn't have a brother those aspirations were transferred to me and my sister." She studied for a Masters in Business Administration at a time when her friends were mostly getting married. She was the youngest member of the HBS class of 1982. "It was good to know I had cut it," she says. Was current Chairman and CEO of General Electric, Jeffrey Immelt, a classmate? Indeed he was. The years at Harvard, Kidwai says, altered her world view and greatly influenced her leadership style. Kidwai is charming, highly amiable, and possesses a lot of pizzazz. "The amazing thing about Naina is that everyone feels comfortable approaching her with any problem - personal or professional," says Ravi Menon, Managing Director and Head of Strategy at HSBC India. "Her opinion is always honest and direct." Behind the genteel exterior, however, is a woman who has engineered some of the biggest deals in post-liberalised India. She arranged funding for infotech giants Infosys and Wipro; managed the initial public offerings, or IPOs, of Maruti Udyog and Bharti Tele-Ventures; was one of the key forces behind the Morgan Stanley-JM Financial joint venture and its subsequent turnaround, making it one of the top investment banks in India. "I am proud of every deal," she says. "Doing deals is like having children. You enjoy them for what they are. The harder deals are more gratifying." Despite her degrees and soaring career, Kidwai says she often faced tremendous pressure to give up. Her mother often asked her to quit once Kidwai herself became a mother. "You constantly have people telling you managing a home and a career is really difficult, are you sure you want to do this? People tell me this all the time." But she persevered, inspired primarily by her father. "If I had stepped away, it would have reflected on all women," she says. "My whole experience was to show how to do it." There were no flexible working hours those days. Washrooms for women were usually located in a dark, dingy corner of the office. There were no laptops - reams of paper had to be carried home in bulky folders to work on at night. Three decades of long hours, meetings at odd hours and constant travel have meant that Kidwai has missed attending important birthdays, anniversary celebrations, festivals and other important family moments. "My father was unwell but I kept delaying going to see him for three months," she says. "Two days before I was to see him, he passed away." Even now, Kidwai works out of two offices, one in Delhi and the other in Mumbai. Apart from her father, Kidwai has drawn inspiration from "ordinary people who do extraordinary things". She remembers a subordinate during the 1993 riots, "Bombay was completely shut down," she says. "I went to work. But my executive assistant also came to work. She had to leave her three-year-old child with a neighbour. That was her work ethic." After years of hectic deal-making and negotiations - during her 13 years at ANZ Grindlays, eight at Morgan Stanley and nearly a decade with HSBC so far - she is gearing up to do some pioneering work in water conservation and women's empowerment. She is also a non-executive director on the board of NestlÃ©, a member of the Audit Advisory Board of the Comptroller and Auditor General of India, and on the governing board of the National Council for Applied Economic Research. At 54, she says she feels as enthused as when she started. "I thought 54 was an age when you get old, dull and retire. But I am nowhere near retiring!"